EB-5 financing accelerates in 2016 and favors (1) Hotels, (2) Mixed-Use and (3) Multifamily as top 3 targets for EB-5 funding. If you have been thinking about tapping into EB-5 financing for your development project, this is the time to make your decision and act quickly. If you need background on what the EB-5 program is about, how it has gone mainstream with institutional investors for several years, and is now providing a steady stream of reliable capital, please see the articles referenced at the bottom. We think that JMBM’s Global Hospitality Group® EB-5 financing team has a pretty good perspective on the opportunity, the risks, and how to get clean execution. We have closed more than $1.5 billion of EB-5 financing and sourced more than half of that for our clients. If you have missed our reporting of key events affecting the availability of EB-5 financing here, you need to know that the EB-5 program was extended for another year through September 30, 2016 without any changes. But just as the maximum number of visas has been reached in each of the past two years, the experts expect that we will “cap out” at the maximum 10,000 visas even earlier in 2016 – possibly as early as May or June. And the “reformers” are still out there, with proposals to revise the EB-5 program the next time it comes up for renewal. So this is a great time to move into action while EB-5 financing continues to be accessible for top developers with great projects and a strong track record. We are confident that most people who delay will wish they had started earlier and gotten in on this great source of relatively inexpensive financing early in the game. NES Financial is one of the top providers of administrative services for EB-5 financing. They focus on escrows and other technology-enabled services for the efficient administration of EB-5 financial transactions, 1031 exchanges and fund administration. See www.nesfinancial.com. JMBM’s EB-5 financing team attended an NES-sponsored “Summit” in Los Angeles on February 4 at the Los Angeles City Club, and it was a great program. I particularly enjoyed the “State of the Industry” presentation by Reid Thomas, Executive Vice President of NES Financial. Here are a few highlights and slides from Reid’s presentation, presented here with permission. Continued expansion of regional centers. There are now almost 800 regional centers in the United States offering to raise EB-5 capital for developers. We continue to believe that less than 10% of the regional centers have raised almost all of the EB-5 capital to date. This makes it critical that developer select the “right” regional center or the developer may spend a lot of time and money with very poor results. Where the EB-5 projects are located. It is no surprise that most of the EB-5 activity is in California, New York, Texas and Florida. In California, Southern California dominates the picture. That said, one of our closings in December for $40 million EB-5 financing was in Nebraska. So the right developer with a great project and proper guidance can find success even outside Los Angeles or New York! The following slide shows project activity by state in 2015.
Who is raising the capital — concentration on the most active developers. The 80-20 rule applies to EB-5 financings. 20% of the projects raise 80% of the capital and 80% of the projects raise only 20% of the capital. The 80-20 rule seems to apply to almost everything in life, and EB-5 financing is no exception. The average EB-5 capital raise for 2015 is $50 million. 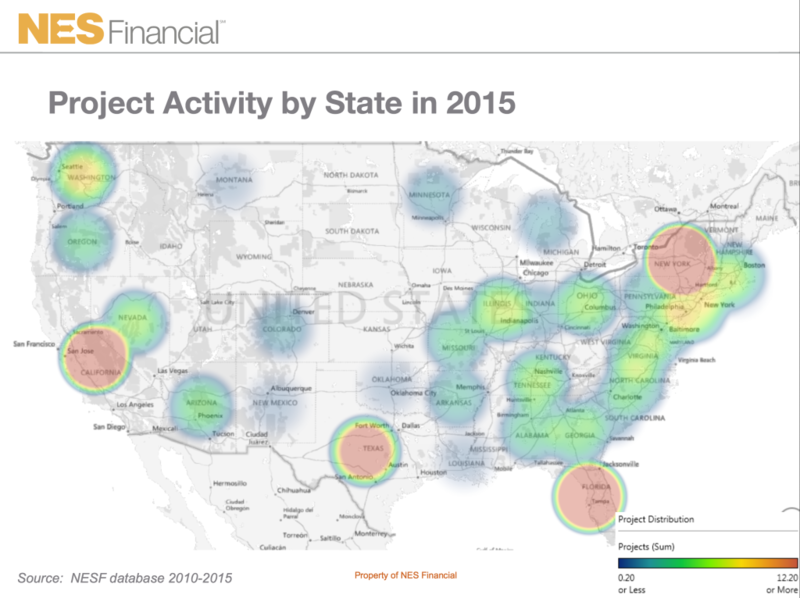 The fastest growing segment of projects in 2015 was multifamily. 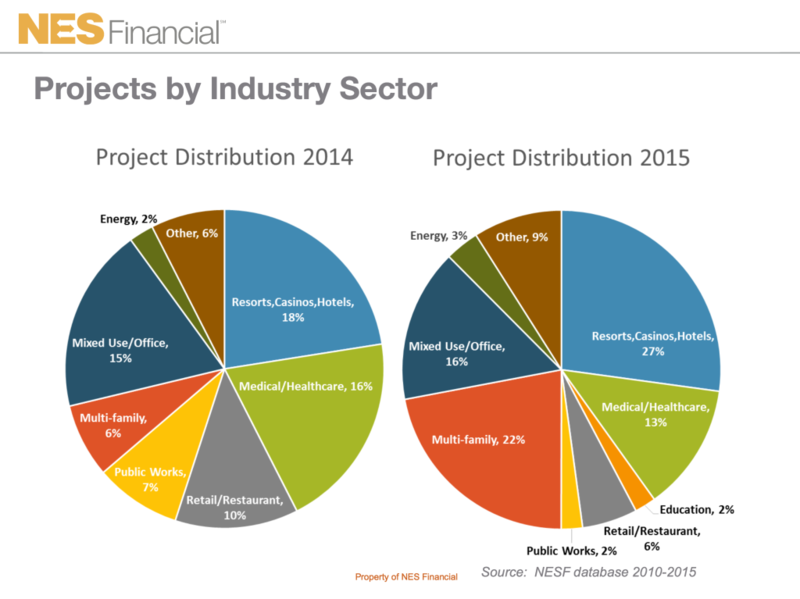 Multifamily went from the number 5 referred sector in 2014 to the number 2 preferred sector in 2015, in terms of projects by industry sector. In general, the amount of EB-5 capital raised roughly parallels the industry sector projects, but there are significant differences. 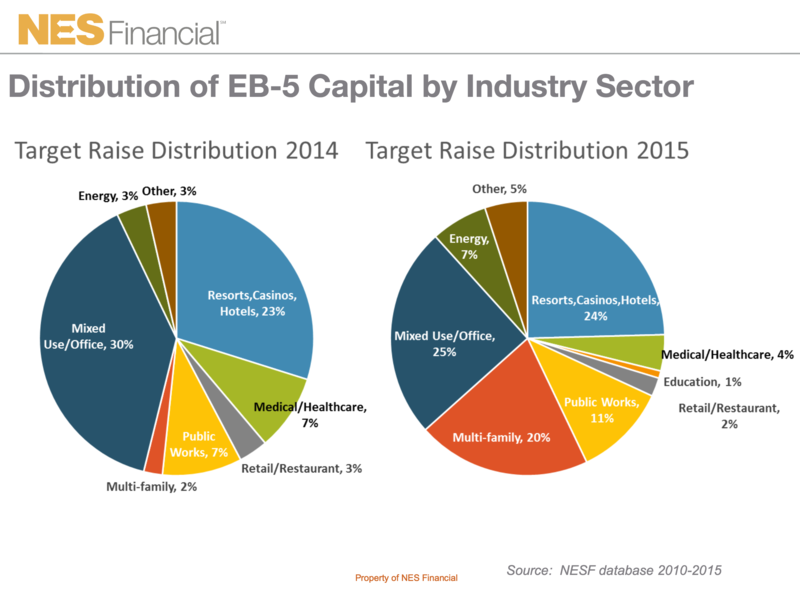 The following slide shows the distribution of the EB-5 capital actually raised by industry sector. Note that, in terms of capital raised, public works greatly exceeded retail/restaurant. Again, the growth in EB-5 financing for multifamily was explosive! In terms of capital raised, multifamily barely registered on the scale in 2014, but almost equaled the other top two leaders in 2015. This is an amazing growth. 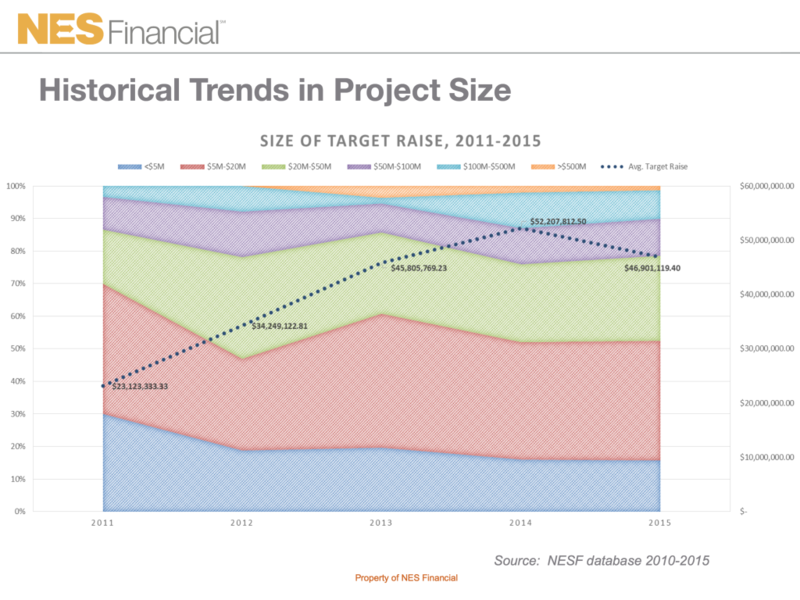 What is the size of projects and the amount of EB-5 capital raised? We specialize in assisting clients raising at least $20 million of EB-5 capital. Although there are a few exceptions, most of our sources are not very interested in raising less than that, unless it is part of a series or a template that can be repeated. Even then, the “sweet spot” that we know for EB-5 capital is substantially above $20 million. However, it is noteworthy that NES Financial’s data shows that in 2015 almost half of the projects (by number) involved an EB-5 capital raise of less than $20 million. 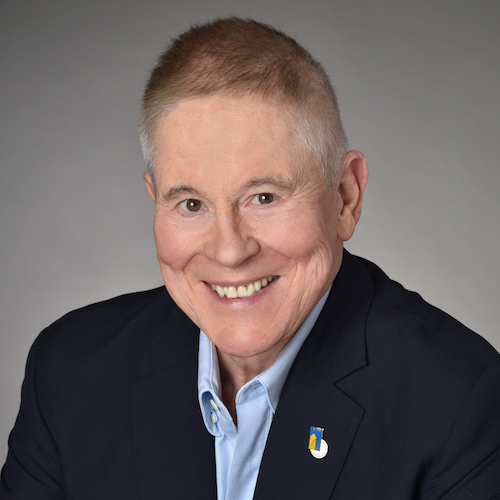 However, in terms of dollars raised, more than 90% involved the capital raise of $20 million or more, and more than 50% of the projects involved $100 million or more. 22% of the projects involved $500 million or more. In historical trends, note that the target raise for EB-5 financing in 2011 was approximately $23 million. In 2014 it was more than $52 million, and in 2015 it was $47 million. This is the data that produces the average EB-5 capital raise of $50 million at the current time. Other observations — where is/will EB-5 capital come from. EB-5 debt continues to dominate. The sweet spot for EB-5 financing is mezzanine debt that will cost 6 or 7% per annum as an all-in cost to the developer/borrower on a 5 to 7 year term. Some experts expected that EB-5 would be used more in an equity position, but that has not developed. China continues to be the dominant source of funds for EB-5 financings. The drop to 2nd place is so significant that it is difficult to imagine. However, Latin America is coming on as an EB-5 investment source as well as the Middle East and Gulf regions. It will be interesting to see if investors from other countries have different expectations on returns than those from the traditional Chinese investor. However, there is a clear trend toward geographical diversification and there may be some changes. Although Columbia, Venezuela and Brazil have experienced explosions in EB-5 capital raise as high as 1400%, they still pale compared to China. However, these 3 countries have finally eclipsed Korea in terms of EB-5 capital, and Korea has historically been the number 2 source of funding for EB-5 financing. There has been something of a hiatus or gap in EB-5 financings as developers and lenders waited to see if Congress would change the law on essential details that affect how (or even whether) a project can be structured for EB-5 — matters such as the minimum investment, how or whether one could qualify as a TEA, how the minimum new jobs requirement would be calculated, and other important business and legal details. Now, as the program has been renewed without a single change, lenders and foreign investors are rushing to fill the pipeline again. And it is much more desirable to be at the front of the line, rather than at the back of the line.